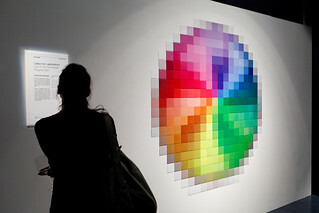 Photo showing the installation "Download Progress Bar" which is part of Ars Electronica Center Linz' new exhibition "Zeit ist Held". People in our fast-paced society have practically zero tolerance for having to wait for something. Nevertheless, we are constantly beset by delays, even in everyday digital life. “Life in the Download Progress Bar” refers to the Apple operating system’s symbol for “wait,” which is recognizable only from several steps away. Each individual pixel corresponds to a task performed by the computer and the time taken to do it. Right up close, the installation visitor can recognize the 312 waiting situations in the digital domain that are transferred and applied to 312 carton-pixels in the real-world exhibition space.